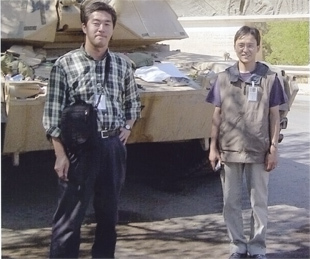 Ambassador Katsuhiko Oku (left) and First Secretary Masamori Inoue (right) in Iraq. This photo was found in Mr Oku's digital camera. The two sides will meet at Twickenham and a fund-raising effort will take place in Ambassador Katsuhiko Oku's memory. Mr Oku belonged to Oxford University RFC and he continued to keep in touch to arrange matches with Japanese Universities, as well as working as a member of the overseas publicity sector of Japan Rugby Football Union. He made a huge contribution to the excellent relationship between the JRFU and other countries' rugby unions, especially the English RFU. Celebrating the bond between Japan and Wales, Japanweek marks the opening of the Wales Millennium Centre and the visit of the Japan national rugby team. Fund raising for the Oku Inoue Fund for Empowering Children will take place throughout all the events and the programme features a finale concert dedicated to the memory of Ambassador Katsuhiko Oku, who was a good friend of Wales. The Oku Inoue Fund for Empowering Children is set up. Copyright(C) oku-inoue-fund.com All Rights Reserved.